At the closure of a collaborative, outstanding, inspiring day I have really valued listening to presentations and conversations and I have learned a great deal, thank you. I’d like first to acknowledge absent friends. In my role as General Secretary of NSEAD I am privileged to be invited to and to attend similar conferences across the UK, and have been for many years. It is sad to see diminishing numbers at these gatherings, not in any way due to lack of enthusiasm or fantastic programmes, but to barriers due to the unintended consequences of government policy on our subject, and funding constraints. So I really appreciate a high turnout today, and well done to everyone who managed to seek positive permissions from Heads and Senior Managers. But let’s just spare a moment to think of those many primary teachers who were unable to attend today, and think how we can reach out to them in other ways. I am sure they are here in spirit, because this is perfect CPD. To put my concern about CPD into context, the NSEAD Survey Report 2015-16 asked over 1,000 teachers across all phases how current government policy is affecting our subject, and subject specific CPD was a hot topic. We found that 55% of primary subject coordinators rarely or never attended subject specific CPD, and 50% self-fund to attend subject specific CPD in their own time. Is this national disgrace I wonder? 67% of teachers would like to attend the courses offered by the museum and gallery sector, only 25% actually access these courses. So this is the challenging landscape we are operating in. A great day only works if there is a great deal of effort behind the scenes in making it work. Thought and energy has been put into today in spades, I’d like to thank SPAEDA, InspirED and our hosts at Hestercombe House for all the work they have done, and of course thank you to all the presenters and workshop facilitators. I’d like to pick up on some threads running through the day. Many of you will be aware of Switched Onto Art, not a one off but a careful and developmental step to inform how SPAEDA best delivers CPD in the future. The core of Switched Onto Art was Switch book, a collaborative sketchbook project involving teachers, cultural leaders and young people. I encourage you to continue to engage in all these fantastic and innovative programmes. The identity and value of Hestercombe House is of high importance to the education and cultural communities of Somerset. Again, returning to the NSEAD Survey Report 2015-16 I am aware of how vital cultural spaces are, as a professional place where our subject proves its point to the outside world. Yet, access for teachers to these spaces cannot be taken for granted. When asked if their schools supported the principle that children and young people should work with creative practitioners and access orgigional works of art, craft and design, 82% of teachers from the independent school sector confirmed their school supported this with only 36% of teachers from the state sector confirming the same. The third thread is the concept of a broad and balanced curriculum. I feel a little responsible, or irresponsible for this, NSEAD is always consulted during any curriculum review and we were consulted on the current curriculum for art and design, as it stands now. Our recommendations were in part listened to, but not enough, so we wrote our own, cunningly popping up under the official DfE version. We cannot underestimate, nor take for granted space for and the value of a broad and balanced curriculum for our children and young people. A glimmer of hope is that now Ofsted are consulting to better understand what a broad and balanced curriculum actually means and looks like. A fourth thread is making, and working in 3D. And this brings me to the inclusion of opportunities for young men to engage in our subject. Every August we scrutinise the GCSE results, which give us a health check for our subject. We have noted that fewer and fewer young men are taking up our subject at KS3, and if we are the subject that excels in inclusion and diversity then this is of concern. Making and 3D are positive strategies to ensure our subject engages young men in the depth and breadth of our subject across all phases. And while I’m thinking about making I’m keen to shout about craft, explicit in our subject despite not having a place in our subject title. Think of the old fashioned values of craft, make, do and mend, thrift, measure twice and cut once. And bring them into the 21st century where, translated into recycle, upcycle and ecologically and ethically sound material and business practices. Craft is ‘a good idea whose time has come’ and we need to celebrate its place in our subject. It’s been an amazing day. What can I give you back? In my work there is a tension between pointing to the ‘unintended’ consequences of government policy on art and design and its teachers, and shining a light on good practice and where all is thriving. We meet termly at the Houses of Parliament where, through our All Party Parliamentary Group for Art, Craft and Design in Education we seek to influence parliamentarians about the issues impacting on our subject. Parliamentarian’s want stories to hook their debate upon, and I can assure you the positive stories of Somerset will be heard at Westminster and by NSEAD members across the UK. Hello, my name is Callum Jauncey and from the 26th to the 30th of June I will be spending my work experience at SPAEDA. I’m not quite sure of what I want to do when I’m older, but I really enjoy art so I thought working here for a week would give me some experience of what it is like to have a career based on art. My first day of work experience was on the 26th of June and it was based on some introductions to the work space and organisation, and to familiarise myself with Hestercombe Gardens. I also made sure all of the information on the database on the inspirED schools was correct and up to date. Later in the day, I joined Sara Dudman and Lucia Harley at a PRU (pupil referral unit) meeting and arts workshop, which consisted of plastic fusion. On the 27th of June, Sara Dudman organised an art project at Huish Episcopi Academy. There were ten year 12 sixth form students involved in the project and my job was to help when needed, to photo document the experience, and to take part if I wanted. The first piece of art that we created was feather printing using water colour paints and real feathers. Next, we did graphite mark making, getting interesting marks by placing an object underneath the paper and drawing over the object with graphite. After that, we combined these two pieces together and started layering them to create depth to the art. The last work of art that was composed was a collaborative piece done in pairs; it would show how birds fly and land on beaches and how the landscape changes over the course of a video. We used many materials such as; graphite, pen, coloured tape, water colour and acrylic paint. My third day at work experience started off with helping out at a PRU visit to the Hestercombe art gallery. In total, there were three year 10 students and one key stage 2 student. They saw the ‘regions of light’ exhibition which featured Rev. John Eagles, Paul Desborough, Rebecca Chesney, and Jem Southam. They found the way the light was captured fascinating, and they all thought it looked beautiful. The other exhibition that they visited was of different schools chosen artwork, the PRU students were so excited to see their artwork up on show amongst the other pieces. Thursday the 29th commenced with me designing the labels for some donation boxes for inspirED. Then, at around 3pm, we left to go to Heathfield. There we set up an inspirED stand where there were lots of leaflets and information sheets. There were also the two donation boxes which I had created. After it was all set up, we went to the hall and watched some amazing performances from different schools, there were varieties of dance, acting and films. When all the performances were finished we went back out to the inspirED stand and waited for everyone else to come out. There were lots of nice people who donated to inspirED and many signed up for extra information. On my last day of work experience, I helped take down the schools exhibition at Hestercombe. It was sad to see it being taken down but it had been up for about a month and had received lots of praise while it was up. Next, I started writing up this blog that you are reading right now. Overall, this has been an amazing experience for me and I have learnt a great deal of things whilst I was here. I highly recommend anyone to do their work experience here. This entry was posted in Uncategorized on June 30, 2017 by spaedablog. Switchbook is a collaborative sketchbook project. It’s 40 participants include artists, teachers, museum and gallery staff, young ambassadors and more! They are making art, responding to each other’s inspiration, sharing practical skills, hands-on workshops, building confidence and contacts and networking at exhibitions and events. Switched on to Art is Spaeda’s Arts Council funded organisational development project. It includes Switchbook, research networks, exhibitions, conferences and consultation with an eye on the future to find out how CPD in arts education can be sustained and developed. This entry was posted in Uncategorized on April 4, 2017 by spaedablog. 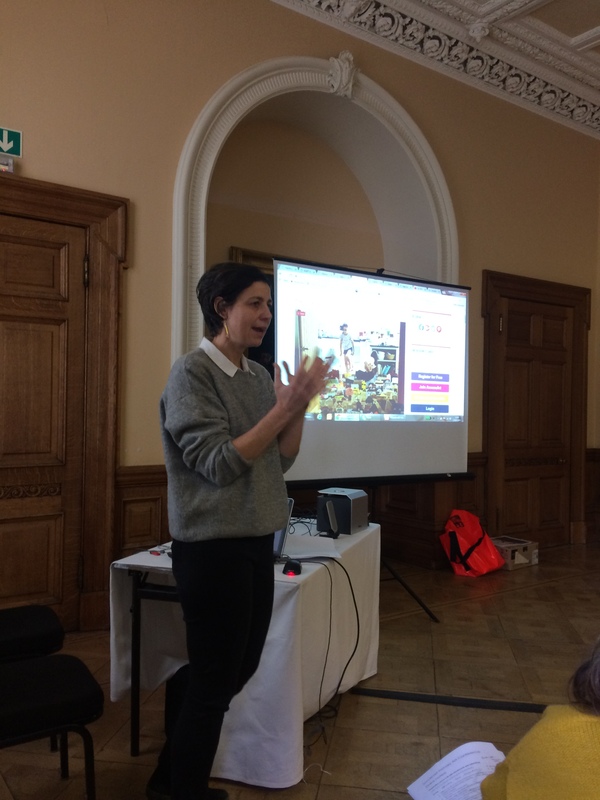 Music organisation Count Me In are offering places for their latest training day, aimed at educators and professionals using music to work in inclusive settings. Based on the methods they use in their Youth Music project AllStars, the team are offering an inspiring and practical day of exploring ways to fully include young people with additional needs and work with mixed ability groups. Details : Jan 30th, 10 – 3.30, Wells Museum. To book : info@heartbeats.org.uk or tel. 01373 813558. This entry was posted in Uncategorized on December 7, 2015 by spaedablog. Want to apply for Artsmark and celebrate your school’s commitment to the arts? SPAEDA and RIO invite you to a briefing to find out all about Arts Award and Artsmark, and how these can benefit your school. The session will be open to music and arts teachers, subject coordinators, governor and senior management representatives. The Briefing Day is FREE for Somerset schools and is a great way to find out about Artsmark, the Arts Award and local arts education opportunities. The new Artsmark launched Autumn 2015. Over the past year RIO has been working closely with ACE and other Bridge organisations to pilot the new Artsmark programme with 100 schools across the country. This briefing will outline the changes and provide an opportunity to ask questions, share your thoughts on how to support the new scheme. Arts Award is a range of unique qualifications that support anyone up to 25 to grow as artists and arts leaders, inspiring them to connect with and take part in the wider arts world through taking challenges in an art form – from fashion to film making and pottery to poetry. Through Arts Award young people gain a nationally recognised qualification enabling them to progress into further education and employment. Arts Award can be based around any arts or media activity, and young people can complete it in a wide variety of settings – like youth clubs, arts centres, schools, colleges, theatres or community groups. This entry was posted in Uncategorized on November 19, 2015 by spaedablog. 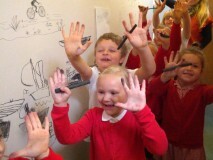 Artist Lizzie Induni led three drawing workshops for local schools. The children learnt how to use charcoal, draw with graphite and origami paper folding. These All the workshops focused on how people live around and use the river. Each student participated with our interactive exhibition, where they were allowed to use charcoal to draw on the walls of the Great Bow Wharf. Every child leant about and then drew Jethro Brice’s Flatner boat, a boat traditionally used on the flooded Somerset moors. Lizzie got the students to work on a collaborative drawing of the river and the environment. These sessions tied in with Jethro and Seila Fernandez’s Some:when exhibition which was also held at the Great Bow Wharf for Somerset Art weeks. Their project revolved around the creation of a Somerset flatner, a traditional local boat used on the levels. This exhibition showcased the boat itself along with artwork made by children and young people, and documentation of a celebratory journey on the River Parrett in summer of 2015. There was also an exhibition of photography from Gideon Mendel in the Kitchen at the Wharf. Gideon’s exhibition “Drowning World” focuses on the Somerset and Thames Valley floods of winter 2013-14; the images show landscapes vanishing under water and portraits of local residents. The Campaign for Drawing’s annual festival The Big Draw, takes place each year in over 20 countries around the world, with 1000+ events taking place over October. This year’s Big Draw theme is “Every Drawing Tells a Story”. Somerset Art Weeks is an annual countywide celebration of the variety and quality of contemporary visual art that can be found in Somerset. Each year SAW produces education resources to encourage schools to view Somerset Art Weeks as a provider of fantastic opportunities right on their doorstep. This entry was posted in Uncategorized on November 11, 2015 by spaedablog.